Former planet Pluto is one of the objects in this belt. The Kuiper Belt extends from about 30 to 55 AU (Astronomical Units) from the Sun. It is believed to be populated with hundreds of thousands of icy bodies larger than 100 km (62 miles) across and an estimated trillion or more comets. First Kuiper Belt Object (KBO) was discovered in 1992, when astronomers detected a faint spec of light from a source 42 AU from the Sun. 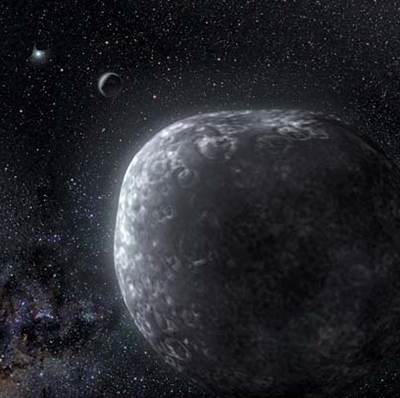 Several dwarf planets similar to the size of Pluto have been discovered in this belt, including Eris, Makemake, and Haumea. Close up observation of the Kuiper belt has begun in 2015, when NASA's New Horizons spacecraft reached Pluto. Kuiper Belt is not to be confused with the hypothetical Oort Cloud. The Oort Cloud has never been seen. It is just a hypothetical idea proposed to try to come up with another source of comets, besides the young comets currently zooming around our Solar System. Oort Cloud theory continues to take a prominent place in mainstream astronomy, as it is the only suggested answer to the question: why do comets that only last for a few thousand years still exist in our Solar System. Image: Artist's concept of Eris and its moon. The sun is in the distance. Image credit: Robert Hurt (IPAC).